Celebrity status in the Philippines is a phenomenon many foreigners will encounter in the archipelago. Some expats, like Tom Ramberg over in Gen San, is often the recipient of wolf whistles from appreciative Filipinas whenever he steps out in public. I’ve been chased and screamed at by pretty pinays as I sat in the rear of a jeepney or tricycle in Guimaras, my island province home. Every time this event occurs I check my barn door to make sure it’s closed. It always is so I can only assume that the young ladies were either stoned on shabu or flirtatious Filipinas from the local KTV bars. I’ve been to events like our local mango festival, Manggahan, with Papa Duck and our respective asawas. Papa D and I were invited to sit in front on pale turquoise plastic chairs at an event one afternoon last year. 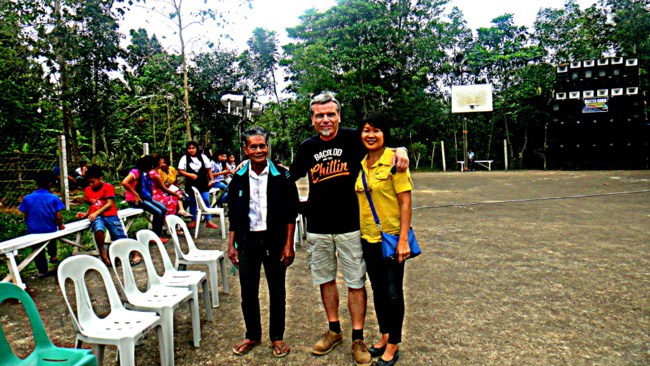 My wife and I have been given special treatment since retiring to the Philippines over five years ago and I know its probably not due to my good looks or charming personality. So when my wife piled Lolo, her father, and her sister, nieces and nephew that live at “The Compound,” my spouse’s other property on our mango province, into our new Ford Ranger XLT to visit some relatives at a nearby fiesta, I was already prepared to draw some attention. We stopped off at Cousin Doenig’s first. 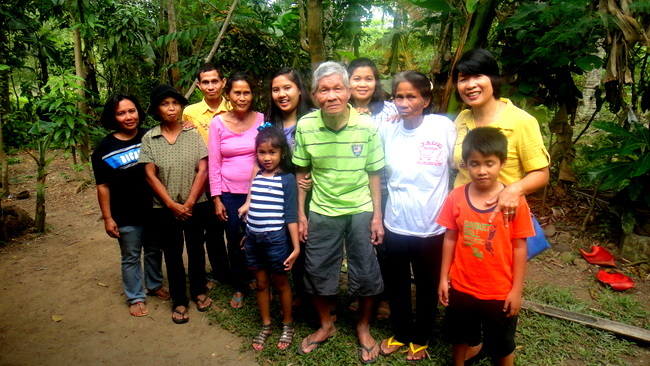 Doenig was part of our nipa hut construction crew and his daughter, Mera, is our domestic helper at “The Farm,” our current location. We were warmly greeted by the clan and immediately directed to a table heaping with traditional Filipino fare: pancit, pork adobo, chicken and a mountain of rice. My wife fixed my plate of food for me like I was a small child but I didn’t complain. I didn’t have to get off my fat posterior and don’t mind getting the royal treatment. But it is always best to start the fiesta travel circuit on an empty stomach. You will be expected to stop and eat at every location and it is considered rude not to. Since I didn’t wish to offend any relatives, I consumed another plate of food at our next stop, more cousins that live down the road from Doenig. Their residence was one that my wife visited as a small child and was a simple structure with a mostly dirt floor with a smidgen of concrete mixed in here and there. The house was crowded with relatives and more visitors stopped by as we ate our food. I told our teen-aged nieces that were with us to go ahead to Fiesta HQ, the main plaza, which was only a short five minute walk from our location. We parked the Ranger on a piece of land nearby. It was off the main dirt road to the festivities and would be safe. We joined the group of teens about 15 minutes later after thanking this group of relatives. It was around 2:00 pm. 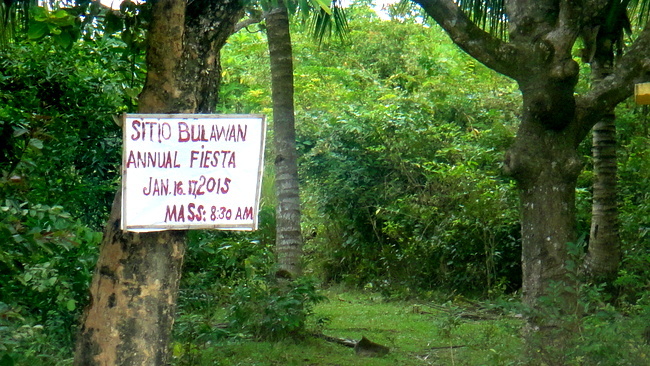 The Sitio Buluwan Annual Fiesta was in full swing. 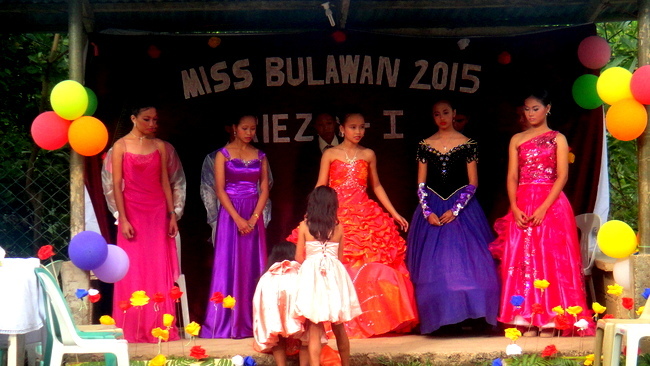 The Miss Bulilit 2015 Queen, Hazel May, was going to be crowned soon. My wife and I paused at a gate to enter the plaza which was fenced off from a throng of people who ringed the fence. I saw some prices posted on the gate and thought we had to pay admission. We didn’t. The charges listed on the gate were for a disco that was to be held later that evening. As we stood for a minute a lady, obviously an official in charge, whisked us away to our own personal plastic chairs in the front row and sat next to us. Celebrity status in the Philippines. 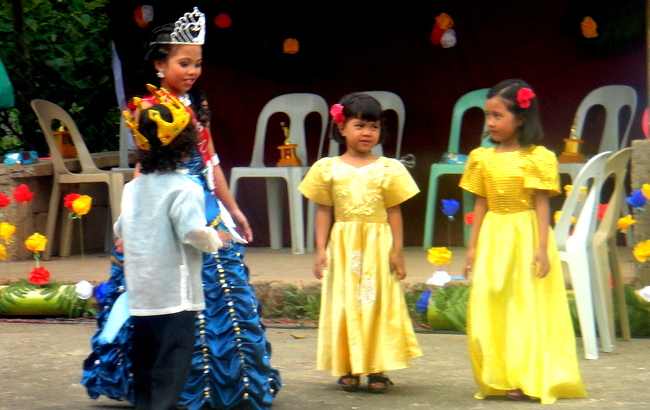 Little did I know that I would award the Barangay Queen her Trophy at this local Barangay Fiesta. But not the little Queen shown in the next photo dancing with her curly-haired pint-sized King. 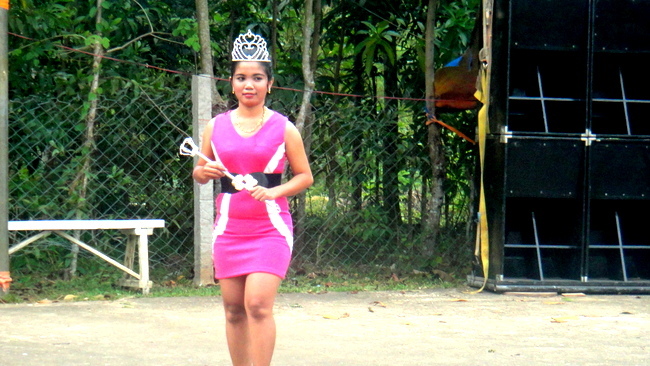 No, I would be selected to present the 2015 Miss Buluwan Queen who would be the official representative for the barangay for the remainder of 2015. One of my wife’s older relatives, Cousin Edgar’s Father, shown standing next to me in the next picture, accompanied us and sat next to me. I later bought him a Red Horse as the vendor I purchased my adult beverages from had thought I had asked for “four” bottles instead of “two.” No problem, only 35 pesos a bottle and I had plenty of relatives to pass the beers to. I handed over a beer to the gentleman who my wife told me had been quite a fighter in his younger days. So I asked. 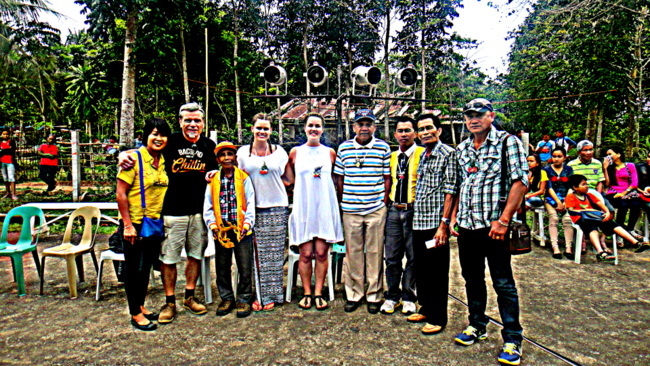 The Swedish ladies were friends of the Barangay President who had been friends of the girls’ parents over 30 years ago. I suspect, though I did not verify, that the parents might have been missionaries, but I did not pursue the matter further. All the local officials made us feel very welcome. After the Little Queen Event we ditched our plastic chairs in the front row and went back to sit with our relatives that we had taken to the Fiesta. That’s Lolo, in the green shirt, front and center, in the next picture. I gave him a cold bottle of Gold Eagle. He was happy. I tried to give him a bottle of Red Horse but my asawa wouldn’t let me. I guess she thought one beer was enough. My father-in-law, afflicted with dementia, is still wound up days later after the fiesta. He’s been singing and talking to dead relatives almost non-stop. My wife informs me that yesterday he was having a good laugh with his sister. Problem is, his sister has been dead for years. But Lolo knew every single relative that we visited and saw at the fiesta. While his dementia drives him to have hallucinations and causes him to try and wander off, he still can remember relatives that he hasn’t seen in years. As my spouse and I were sitting and watching the 2015 Buluwan Queen ceremonies, a relative came up behind us and asked if we would present the award to the new King and Queen of Buluwan. No problem. I’m not shy. As we waited for the 2014 Queen, shown below, to hand over her scepter and crown, my wife and I were called up to the stage. I handed the trophy to the Queen and my wife handed a gift to the King. The King’s mother was the relative who asked if we could present the awards. That’s Cousin Doenig’s son, DonDon, dancing with one of the princesses of the Royal Court. The young lady is only 14 years. The Queen is the young lady in the orange dress in the lead photo. I shook her hand, along with her Nanay, mother, who was also on stage and congratulated the both of them. I also got to shake the hand of the King. We left the fiesta around 4:30. 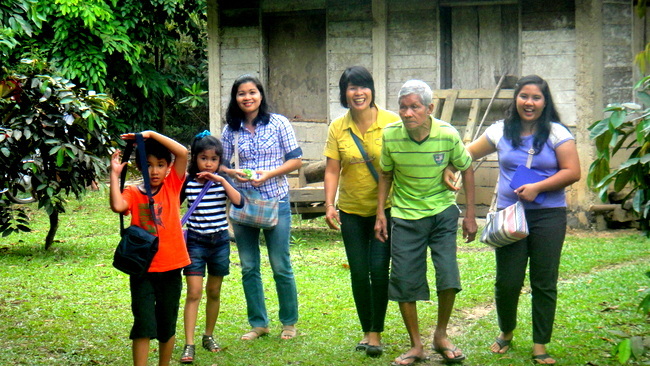 That’s our niece Michelle on the right, in the next photo, who is helping Lolo back to our truck.Michelle is teaching at my sister-in-law’s preschool in Guimaras. Sister-in-law Alida is third from the left. Nephew Jorreale and niece JalAmiel are standing next to their Mom and my own lovely asawa is helping out her Dad. Michelle has gained a few pounds since she started helping out at the school. She’s also living with her Tita Alida and doesn’t always care for Joery’s cooking. Joery, our brother-in-law, husband of Alida, had to deliver his salted eggs to Buena Vista in Guimaras and couldn’t make it to the fiesta. Joery also has a sari sari store at the Preschool and Michelle raids the store for soft drinks and snacks instead of eating the healthier meals Joery prepares. Our niece Shaina stayed overnight at Cousin Doenig’s house, along with our helper Mera. When Shaina arrived home the next day, Lolo asked if anyone was killed at the fiesta in the fight the night before. There was an altercation hours after we left but no one was killed. How on earth my father-in-law knew there was a fight is beyond me but I suspect that the dead relatives he talks to everyday filled him in. Looks like a good time was had by all. It’s always enjoyable to be treated special here. That’s one of the perks of living here. Today they start building your house. I know it’s very exciting for Melinda and Yourself. Yep, as you know, Papa Duck, we do receive the V.I.P. treatment in the Philippines. I’m used to it by now but for a guy just arriving in “paradise” it might come as a surprise. Being an expat in the Philippines means you probably will receive some extra attention wherever you go, wanted or unwanted. Derek, I’m of the belief that if someone is unhappy here, chances are they are miserable wherever they go. I’ve been snubbed by expats over in Iloilo before. Some foreigners here are about as friendly as a box of rocks. Haven’t had that problem much in Guimaras. It is simply amazing the amount of attention we receive. I’m well aware that in some cases it could be that “ATM” we have stamped on our forehead, though in your case, Derek, I’m suire it’s your good looks and abundance of charm. Regardless, the majority of folks here are friendly. I just got back from our local Sari Sari store to pick up some ice cream and a five-day old peanut butter coffee-flavored cake for my 15th Wedding Anniversary. Now I know what some of you guys might be thinking. I’m going all out to celebrate what with a five-day old cake and all. But my wife is at our property site and doesn’t want to go out anywhere to eat, so that’s why I’m pulling out all the stops. And what the heck. I saved 20 pesos from a traveling salesman in front of the sari sari. Got him to knock off 20 pesos on a belt he was asking 350 for. It looks and smells like leather so I think it’s the real deal. Life in the Philippines. Every day is an adventure. Hope you and Melinda had a nice 15th Anniversary with many many more to come. I want to give you a call this weekend, whats a good time to call you. Take care. Thanks, Papa Duck. Well, I’ve been down with a cold all week and Melinda has been at the new construction site. Maybe Sunday would be a good time to call. Take care. Dawg, I’m so old that I remember Dad filling up the old 59 Chevy for 19¢ a gallon at Russel Soulsby’s Shell on Route 66 in Mt. Olive, Illinois. My Dad ran over 25 different service stations over the years and when gas hit 50¢ a gallon in the early 70’s people were screaming bloody murder. Now, we filled up the 80 liter capacity Ranger at the Shell Station in Iloilo. 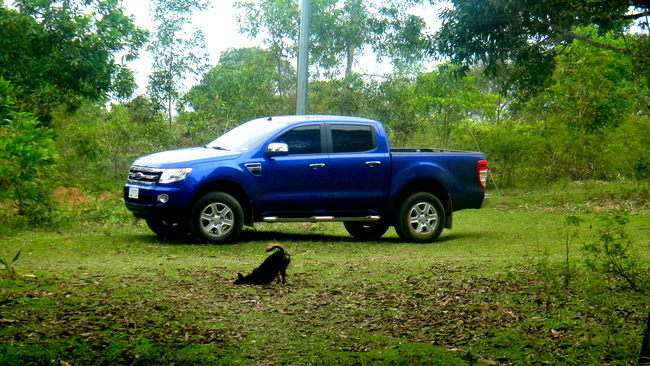 Ford gave us 10 free liters and it cost us 1700 pesos, 37 bucks, to fill up the remaining 70. We have a diesel engine so that figures to 24 pesos per liter, or about 2.00 US Dollars a gallon or so, if I figured correctly and using a 45 to 1 peso to usd ration. But I’m taking cold medication so don’t hold me to those figures. Thanks, Derek. Yeah, I’ll try not to go too overboard. My wife has been back in the Philippines for five years and has pretty much lost all the “Americanization” she acquired after nine years living with me in the States. I, too, remember 19-cent gasoline. And we thought that price was too high. Bring back the good ol’ days. And Bootlegge, my Dad burned up a lot of that 19¢ gasoline on the Mother Road, Route 66. Those were the good ol’ days, to be sure.